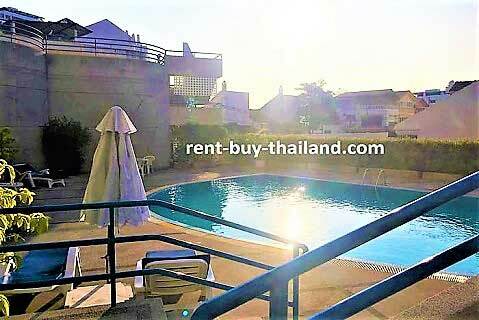 Rental Price 15,000 - 23,000 Thai Baht per month depending on season and length of stay. This is a fantastic sixth floor studio at Peak Condominium with a sea view. The apartment has been decorated to a high standard and is fully furnished. The apartment consists of an open plan sleeping, living, dining and kitchen area, a bathroom, and a balcony. The European style kitchen is fully equipped with all you need, including pots and pans, crockery and cutlery etc, along with an electric hob, extractor fan, microwave, kettle, toaster and refrigerator. The main living area contains a double bed, storage units including a wardrobe, drawers, dressing table, bedside units and display units; a sofa, a coffee table and a flat screen TV and DVD player along with access to the balcony via large sliding doors. There is also a dining area with a table and chairs. The bathroom is fully tiled, with a large work surface containing a sink, and a large walk in shower. There is a balcony, with a table and chairs, which provides a fabulous sea view. The apartment also benefits tiled flooring, curtains and down-lighting throughout, along with a ceiling fan and air conditioning. Peak Condominium is in a great location and has a village atmosphere; positioned in the centrally located Pratumnak Hill, the preferred location for many foreigners as it is nestled between South Pattaya and Jomtien. The building is just a stones-throw from the beautiful Cosy Beach, and there are plenty of shops and restaurants in the area. The complex benefits from a large swimming pool, Jacuzzi, steam room, restaurant, 24 hour security and CCTV system. For sale|rent – Easy payment plans available - no credit check required. Other sea view studios around the area available please inquire for more details.